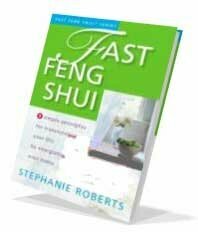 "Stephanie Roberts covers it all in this easy to follow, simple, yet profoundly workable Feng Shui classic. Many of the other books on Feng Shui are complex, which is fine, if you are a Feng Shui expert. However, if you truly want Feng Shui to WORK in your life, and you don't want to take years of courses on the subject, the author provides all of the answers in a simple, beautifully formatted book that I will certainly turn to time and time again. Stephanie Roberts is an expert in this field - this book will bring you all you need to clear your life, and create space for everything you desire to enter. Highly Recommended!" "Just want to let you know that after I read your book four days ago, I moved my house around. $100 magically appeared in my bank account from who knows where, and I can pay my utility bill after all!!! [And then] another 167.00 just appeared. My old job ended, and it was summer insurance returned to me. I never expected it or knew it was coming!" "I received 'Fast Feng Shui' in the mail and began to review the chapters last night. I had to begin reading and found I couldn't stop. "I have several Feng Shui books, and I must tell you that yours is wonderful and I can't wait to get to it again. "The read is wonderful for many reasons, you put things in a natural progression, and explain everything in such a way that I am not confused. I am a reading addict and have a background working with college students, taking difficult materials and explaining them in an easy to understand way. "I am pretty bright, but all the other books made me feel as if I was going in circles and eventually I felt frustrated by the overwhelming amount of 'things' that needed to be figured out. I understood what the authors were saying, but I found myself surrounded with maps, color templates, and mounds of papers trying to make perfect sense of it all. After a while I would have to put everything aside and I didn't feel as if I was going to be able to use all of it. "Thank you for taking the mystery out of Feng Shui and putting everything in this natural progression. I didn't feel at all overwhelmed or intimidated. "I am excited about working with all of your materials. Again, I thank you and I want you to know how much I appreciate your wonderful way in helping with Cluttering Clearing and Feng Shui. I feel fortunate that I 'found' you. "I was ready to move, to a new country, county, a town, anywhere. My husband and I were in a rut, unhappy with our lives, our job and our 'things'. After reading your book, we are both energized and ready to change all that. We are actually enjoying the togetherness of our experience in going through all our 'stuff'. Thanks for the experience. I really recommend this book." "I bought the Fast Feng Shui book because I'm putting my house on the market and moving to another state. I rapidly read the book and decided that I needed a complete overhaul in order to show the house properly. I had no idea I had so much clutter!!!! Using the Feng Shui principles, I have totally changed the appearance of all my rooms. I have bought nothing extra, just moved the items that I own into different areas. And got rid of the clutter. The realtor came to review my property this last Saturday and she just went on and on about what a wonderful ambiance my house has. Believe me, it's only the Feng Shui. Within 30 days of cleaning up my wealth area, I've been offered an investment opportunity that really surprised me and I've lost 10 pounds. Thank you for the wonderful suggestions." "I LOVE your book! I'm going to order at least four more copies for my daughters and friends. The content is the best, most simple, and 'what I want to know' out of all the feng shui books I've read to date." "[Fast Feng Shui] is one of the few feng shui books which is understandable and well organized. I always struggle with book suggestions when my clients and students ask me. There is such a plethora of horrible feng shui books on the market. I will add yours to those by Terah K. Collins, Karen Kingston, Nancy SantoPietro, Denise Linn, and Carole Hyder. Congratulations and thank you." "This book - 'Fast Feng Shui' - is amazingly simple and easy to follow. Once you start reading, you will want to apply the concepts to your whole house. This book gives lots of great ideas, so that you can get started right away. The contents are organized in a way that makes it easy to focus on exactly what your goals are. The first day I got this book, I was walking around my house making changes. That is FAST!" and your life by using feng shui? I am so convinced that you will be delighted with this ebook, that I am offering a 90-day, no-questions-asked, 100% money-back guarantee! If you are not satisfied with the Fast Feng Shui ebook for any reason, just contact me within 90 days of your purchase, and I will refund your entire purchase price of $16.95. To get instant access to the Fast Feng Shui: 9 Simple Principles for Transforming Your Life by Energizing Your Home (250 pages) in Adobe Acrobat PDF format please click the following link to be transferred to our secure ClickBank® payment server. If you'd prefer the trade paperback edition, click here to order from Amazon.com.